In addition to my B/X campaign, I've been working on some concepts for a combination of a world setting and a megadungeon. But it's a bit different from what I've been doing previously. I want to talk a bit about where I'm thinking of going in terms of world creation, theme and influences. A big thing thematically that I want to achieve with this setting is to do a world that is, at the same time, both recognizable as Dungeons & Dragons, and isn't at all a generic fantasy setting. Hence the deinonychus above. What I'd really like to get down is a science fantasy world that doesn't have a gonzo, crazy-go-nuts feel. I know that's an odd balance to hit when your goal is wizards and laser rifles, but I feel that it's a time-honored part of Dungeons & Dragons that should still be able to take itself with a modicum of seriousness. Part of that is doing things like dinosaurs but having them be scary rather than wacky. 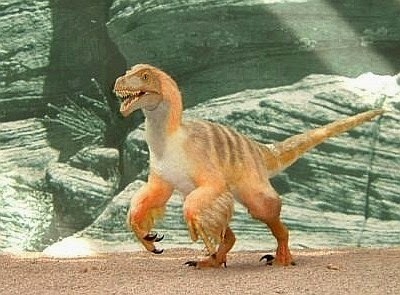 Again, hence deinonychus. 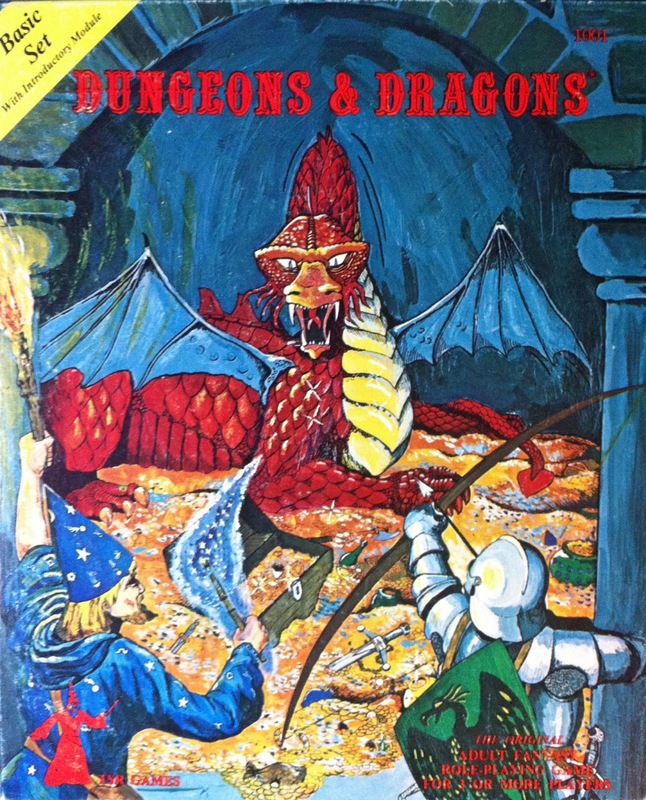 The basic assumption of the Dungeons & Dragons setting is that it's a pseudo-medieval world. I'm not going with that, although the PCs still look and act basically the same. The underlying idea is that the main human civilization are themselves literally aliens. The world that the PCs (well, their ancestors) come from is a high-magic world with all of the standard fantasy trimmings. They no longer live there. During the magical equivalent of a global thermonuclear war, the Second Empire opened a gate to another world. The first brave and hardy settlers had wizards helping them; much of their resources and knowledge were lost, but fragments remain. Now it is two centuries later, and the human realm (name TBD) has gone into a semblance of normal life. So there are several sources of monsters. One is the other civilizations of the world that the humans came into; at this point the one they have the most contact with are lizardmen, who live in a vast swampy kingdom to the south of the human settlement. They have some weird technology, mostly a mix of found tech from previous civilizations – nothing orderly and modern, but enough that humans pose no fundamental threat to them. As to the megadungeon itself, it's a multi-level dungeon that happens to be built near the ruined and long-since buried capital of an Atlantis style civilization, a mix of high technology and high magic. There are tribes of primitive blue-skinned humans living underground, the descendants of the last survivors of this world; they are savage and have no memory of their lost homeland, only a sort of religious worship of some of its artifacts. Giant rats, spiders, scorpions and other horrors are naturals for dungeons. The Dungeon Master should adjust the monster's hit dice to the depth below the surface and assign a suitable armor class. These creatures fight ferociously, have special abilities, and there are many interesting possibilities. I really love that bit about "have special abilities." Yes, you know what a fire beetle is in a standard D&D world, but the beetles in this world might be based on the bombardier beetle. Future posts will talk more about this as I flesh out the world and solidify more of its aspects. But I'd be interested in reading what thoughts and ideas folks have for developing this kind of setting while keeping it feeling like a more or less logical world, not a zany mish-mash. As a referee, I am known among my players for emphasizing the capricious nature of missile weapons. I believe in the chaos of melee, and when a character fires into melee and misses, I often have them make a second roll to hit against a nearby target. Often an ally. That's not to say I don't like missile weapons. When I was younger I wasn't half bad at archery, though mostly with modern compound bows. My father did a lot of hunting and while I picked roleplaying over hunting deer, I did a good deal of practice. D&D of course has three kinds of bow: self bows (short and long), laminates (composite bows) and crossbows. In Holmes the differences are mostly technical ones to do with range, and even Moldvay with variable weapon damage sticks them all at d6. So why would you use one over the other? Bows are fast. Crossbows are slow. That's a fundamental difference - bows should fire quickly while crossbows need reloading. In reconstructed Holmes combat I'd think about giving bows 2 fires per round while keeping crossbows to 1/round and heavy crossbows at once every other round. So why would you have a crossbow at all? The reason turns out to be simple. 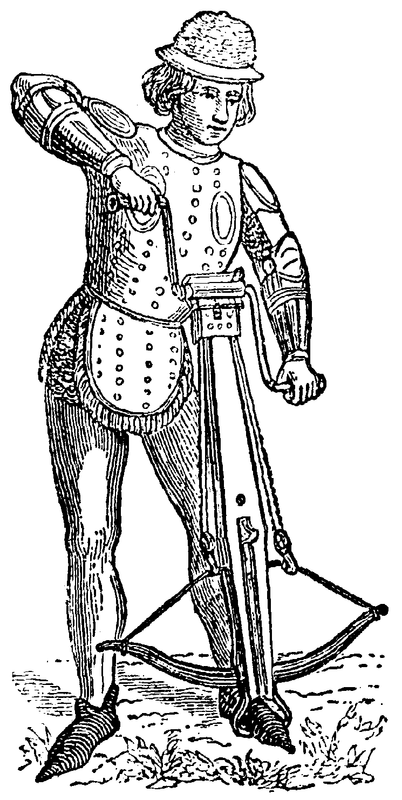 A crossbow is designed to be drawn and held at tension. You cannot be a sniper with a longbow. You can't hold someone at the point of an arrow for more than a handful of seconds; if the string has a reasonable draw weight, you'll start to waver sooner rather than later. If you want to wait for an enemy to pop his head around a corner and fire, you want a crossbow. If you intend to hold a victim at the point of a weapon, a crossbow is the better solution. If you want to do your dungeon exploration and be able to fire on an opponent at a moment's notice, that's a job for a crossbow. A crossbow seems like a dungeon weapon to me in a way a self bow doesn't. Traditionally self bows and composite bows were fired up, to get a better trajectory, and were used for raining down hundreds of missiles rather indiscriminately on an enemy force. Crossbows were more of a siege weapon, the kind that really feel like dungeon combat. In a dungeon, I figure that most arrow traps are crossbow-type rigs. This makes it easy to have a pressure or tripwire switch that releases the tension and lets the arrow fly. Besides, the kobolds who go around checking on the traps probably aren't strong enough to pull it on their own and need a winch. I've re-assigned the old Cryptid Wednesday posts to a category called "Cryptid Corner," the new name of this feature. I've left the old names of the posts but the tags are all corrected. Today we go to the Balkans for a cryptid plant rather than a creature as such. 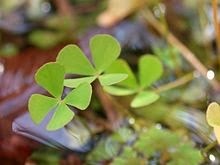 In remote and distant fields grow an herb called raskovnik, or thief's clover. It grows in close proximity with other herbs, and an untrained eye could pass over a specimen a hundred times without ever espying it. The herb can be found with some difficulty by druids, yielding at best 1 quatrefoil per hour. Tortoises and snakes are quite capable of finding it, and will be able to direct a character to a clump of 1-6 quatrefoils per hour. This never reaches more than 10 quatrefoils found in a given field in a month. When the stem of a raskovnik plant is placed in a lock for 1 turn, the lock will be opened (it is permanently broken). This applies to all non-magical locks, regardless of complexity. Inserting a raskovnik stem into a trapped lock will trigger the trap on a roll of 1-2 in 1d6. A Wizard Locked door can only be opened by a number of raskovnik quatrefoils equal to the level of the magic-user who cast the spell. Other magical locks are similarly effected. A tea can be brewed from at least six raskovnik plants in eight ounces of water. This must be steeped for at least 4 hours to gain the desired effect, and the plants so brewed lose their lock-opening powers. The remaining tea is strongly concentrated and, if drunk, will grant the ability to detect the largest treasure within 120' of the imbiber for 2-12 turns. Rodents have an insatiable appetite for raskovnik. Hedgehogs, giant rats and other rodent-like creatures within 60' of a raskovnik plant (living or cut) can smell it and will seek to devour it immediately, ignoring anything that comes between itself and the plant. My players finished the romp through the Cinder Throne, so I can share that this was the map that I was using without it being a spoiler per se. I really loved a few things about this dungeon and how it turned out. Last night's group was as different as could be from the previous delve. Before there had been a fighter, an elf and two thieves. This time there were two fighters, a dwarf, two clerics and two elves, including the fighter and elf from the last session. It helped that the first fighter and the dwarf were level 3 and the other fighter had been sitting right below level 3 from a previous adventure. The troglodytes that had seemed like a bad idea the previous time were pretty readily dealt with this time. A random encounter with a party of Veterans turned into some harmless parlaying; the fact that it happened as they were leaving the troglodyte room and most of the fighters got sick from the stench helped with that. The dwarf PC's hardiness proved itself when a giant black widow spider got the jump on the party; it bit him but dwarves are great at saving versus poison. The party was able to set fire to the webs and do some damage to the other spider hiding in the web-filled room, and take it out before it could do more damage. The Moldvay rules really encourage setting stuff on fire, and particularly spiderwebs if you read the description of the Web spell – the black widow spider webs are explicitly like the spell. I guess the logical deterrent would be to have something valuable like a scroll, or a human voice crying out from the spiderweb; otherwise a room full of webs is an invitation to set fire. I had put an arrow trap in the angled hall with a niche toward the center of the map. The PCs used a 10-foot pole to prod the niche and trigger all the arrows, and the elves found the secret hole in the wall with some gold; if they hadn't prodded ahead, there was a second pressure plate in front of the gold that would've fired arrows. This carefulness went to the wind with the dead end a bit further on, where one of the elves promptly fell into a pit trap. There's just something about pit traps that gets 'em every time. Then, because variety is the spice of life, I threw in some OD&D gnolls. Not that they're mechanically any different from Moldvay gnolls, which fit the hyena-man variety, but the vibe was a little non-standard when I was doing the dungeon stocking and I enjoy simple reskins like this. One of the elves wisely used a Sleep as the gnolls had spent their surprise round throwing axes at the PCs, so that was ended rather quickly. It wound up with one of the long-suffering fighters getting a Sword +2, so that was worth it. After the gnolls they managed to get pretty much straight on to the area at the bottom of the map, going down into the room at the base, which had a weird pillar that would sometimes tell the truth and sometimes lie (by random roll). I can't remember which particular random generator I pulled this one from, but it worked and the PCs used questioning to figure out which room had the crown they were seeking. So they went to that room and saw the crown. Now, I should mention that the dungeon walls bore scorch marks, pretty much throughout, as an atmospheric thing. I placed the crown in the one room with no scorch marks, and that single detail freaked the players out. They wound up dragging a heavy chest via rope, to make sure it was not trapped, and then checking almost every element of the room for traps. Except for the ceiling. So when they finally made the plan for the elves to grab the crown and run, with everyone else already cleared out of the dungeon, the gray ooze lurking on the ceiling made short work of the elves. The red herring of some horrible fire trap had gotten the players to carefully check every aspect of the room except the one that had the actual danger, including performing a Detect Magic. The other PCs came back and managed to get the crown, which was worth 5000 GP, and rightly was the crux of the adventure. Gray oozes are very slow and this one was already "feeding", so it ended well for the more established fighters and clerics. It's fascinating for me when plans go like that; I had decided in advance that only specific inspection of the ceiling would give hints to the ooze and the players didn't check it. If they had, they would have had to deal with the ooze otherwise. I can't over-emphasize how happy I was with Dyson's map. The three-dimensional elements and hidden chutes were really quite neat and added a dynamic to the adventure that I enjoyed very much. I played with the "S" circles being like manhole covers that the players lifted to get to the chutes below. I stocked it using Moldvay's dungeon stocking rules, which usually lead to a pretty interesting time, and used various substitutions as I saw appropriate. One thing I've been careful to do is add 1d10-5 to anything with tens of coins, or 1d100-50 to anything with hundreds, which results in coin amounts that don't feel arbitrary. (I never give exact totals until the PCs are out of the dungeon, of course.) I have generally replaced about half of the "typical" encounter types with unusual and bizarre things; it creates a memorable impression without being too much in weird-land. So the game goes on, and the next adventure I might have a couple options available for the players to pick a direction. Overall Moldvay works really well in practice, even if it has a few pyromaniacal tendencies. Back last summer, I had done a post called Spell Effects in the Dungeon looking at the spells in Men & Magic as spells that had been cast well in advance of player characters coming down through a dungeon. 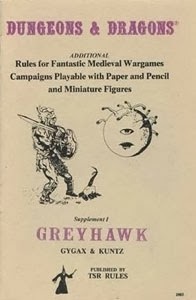 In this follow-up I will be looking at the spells from Supplement I: Greyhawk and their potential impact on a dungeon. One note is that Greyhawk has Permanent Spell, so I'm disregarding the duration limits for these spells. Assume that the magic-user is either an archmage, or has scrolls or other access to Permanent Spell. Note that this is a general improvement for having spells pre-cast in the dungeon. Darkness, 5' Radius. Make one square of 10' map into absolute darkness. Great for setting the mood or hiding a devious trap. Or create the apparently infinite pit trap: Darkness and Silence at the bottom of a 10' pit. People fall in and you can neither hear nor see them. Web. Nothing like a big sticky mess for characters to wade into. Very good for lining pit traps, the bottom of a chute, or in front of the lair of a monster. Magic Mouth. There's a lot of potential for these. Greyhawk lists the possibility of using them attuned to alignment, or specific individuals. This makes them excellent alarms, but they're also good if you want to give a riddle, a joke or invoke a trap. For instance, consider a Magic Mouth rigged to deliver the command word to a wand of Fireball - a perfect explosion trap. The structure of the spell gives a perfect excuse why dungeon denizens don't set off the trap, too. Of course, this can be used on other kinds of wand to make different traps. Pyrotechnics. The fireworks variant is good if you combine it with the Magic Mouth wand trick detailed above. A permanent smoke effect can create a nice low-visibility area for a trick or trap, or a fake "dragon" lair that will freak a low-level party out. Explosive Runes. Well, this one is pretty obvious. BOOM! Rope Trick. A rope ascends upward and disappears into another dimension. Pulling it will bring whatever is at the top of the rope down on the characters. My personal inclination is to stick a bear or two up there, but it can be pretty much anything you'd like to have inquisitive PCs bring down on their own heads. Suggestion. You can pretty much have an otherwise intelligent character doing anything the magic-user would like. It's prime for just plain weird encounters – why is that guy carrying a bucket of acid back and forth? The wizard told him to. Ice Storm. If you are using 10' squares, in a dungeon, the ice storm can impact 27 squares - a big swath of the dungeon. If temperatures cooperate, this will let you create a frozen sub-environment with slick floors, icy hailstones, and/or snow - or with permanency, a perpetual ice storm. If is too warm, you can wind up flooding the same area. Repulsion. Creative casting can make a room, area or object unapproachable in a spectacular way. Most interesting if PCs try using missile weapons on it. Reverse Gravity. It's pretty obvious what you need to do here. Three 10' cubes have reverse gravity and characters entering them fall upward. Very interesting in a room where only part of this is true. Extra fun bonus: make the ceilings more than 10' high. Charm Plants. The spell description says explicitly that it's a good warning system. Not to mention things like strangulation ivy. Mass Invisibility. What's better: six invisible dragons or a small invisible army (300 men plus horses)? Either way this packs some punch. Symbol. This is of course made to go into the dungeon. The Death symbol is pretty much concentrated havoc, though others such as Discord have roleplaying potential. Polymorph Any Object. This spell pretty much lets you make anything you want. Time Stop. Using this as a trap may cause some very interesting philosophical debate. If you want to make creative solutions necessary instead of a Dispel Magic, stick the nastiest monster you can find in the affected area. Prismatic Wall. When you really need to stop someone from getting in. Now, I could go and list the Limited Wish and Wish spells - but they pretty much would let you do anything you want. That's endlessly creative but has no specific ramifications to look at. Overall I thin the Greyhawk spells have a lot to contribute to the dungeon by having them cast in advance of PCs arriving. The Holmes "Blue Book" rules are well known as the original "Basic" rules for D&D, a bridge between OD&D and what we now know as the "classic" line – B/X, BECMI and Rules Cyclopedia D&D. They also have assorted references to AD&D, although few rules actually reference the advanced version in anything more than a one-liner. Over the last few months, the Zenopus Archives have been excavating a typed manuscript that Holmes had turned over to TSR, before (relatively arbitrary) changes were made to the original. 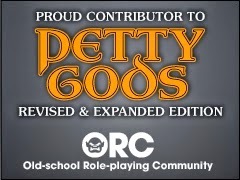 You can read the whole series here; it has gotten up to the monster section and is revealing that the original picks were a bit more diverse and OD&D-inspired. But here I want to focus on Holmes's combat system, because it kind of went astray in the TSR version. The blue book is infamous for a rule that makes daggers super-weapons and two-handed swords virtually useless. It also makes fighters (always d6 damage) less useful than most monsters, who do variable damage. But this turns out not to be how Holmes actually intended it. Instead we find that Holmes didn't actually include damage in his monster listings and assumed that everything had 1d6 for damage and for hit dice. This draws things even and actually puts a first level fighter at a slight advantage over the orc, particularly if said fighter has a high Constitution score. Statistically it works out about the same as OD&D's 1d6+1 hit points for the fighter at first level. 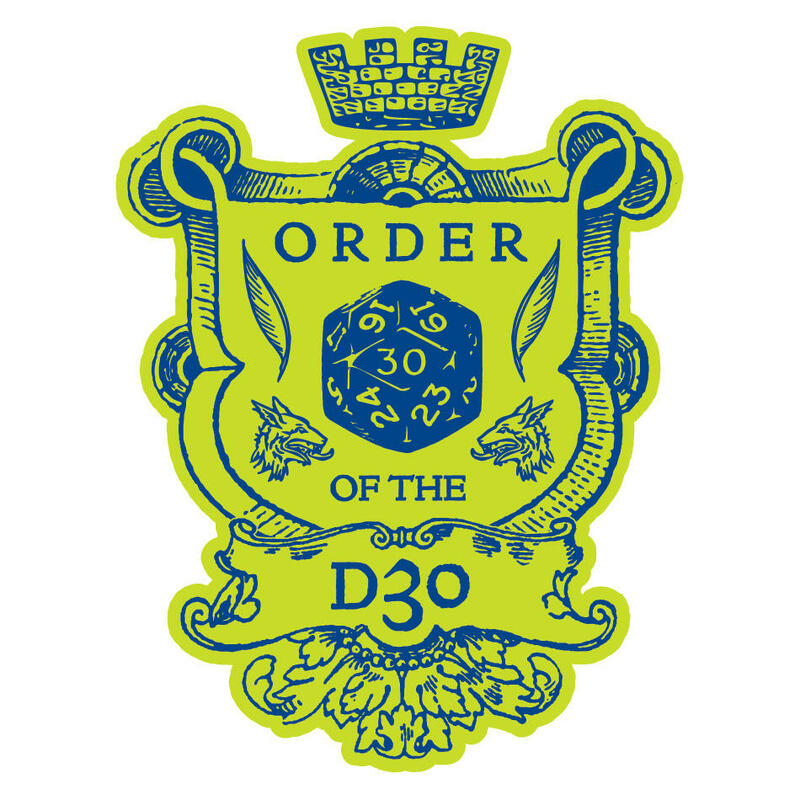 Order of combat was based on Dexterity just as in the published blue book. Zenopus points out the OD&D basis of this rule, although Holmes used it more strictly than the OD&D FAQ implies. But where it gets really interesting is in Holmes's description of the melee round. He described it precisely - "Each round consists of an exchange of two blows with ordinary weapons." When this was excised from the blue book as printed by TSR, it made a muddle of the dagger rules, which simply followed normal weapons such as the sword in striking twice. Two-handed weapons and missile weapons only went once in a Holmes round. This is a much more workable system than the published blue book, which slowed two-handed weapons down to 1 strike per 2 rounds, while leaving daggers at full speed. It also has a number of interesting implications. First, it makes melee combat quite powerful in comparison to using spells and special abilities, since the latter goes off only once in a round; melee characters are working twice as fast as their spellcasting counterparts. Second, it makes parrying an attractive option: a PC can opt to make two strikes in a round, or one strike and a parry, or even to do a double parry. An interesting wrinkle is that TSR added the concept that shields do not count toward AC when retreating; it's a rather cumbersome rule that seems more in line with some AD&D combat than basic or OD&D. Also, through some analysis of the examples of combat, Zenopus comes to the conclusion that magic-users can't cast spells the round after they are struck in combat. This follows a rough order of spells, missile fire, then two bouts of melee. This is one of the more interesting combat systems devised for D&D. It needs some tweaking, particularly in the case of morale, and it needs a rule to make two-handed weapons worthwhile, but it's got significant advantages over the system presented in the published blue book. The double melee attacks per round and parry rules make for some rich tactical choices, and create the potential to expand to extra attacks at higher levels without throwing everything out of whack. You can give fighters 3 attacks for every 2 of lower level opponents, without it seeming absurd or doing AD&D's odd alternating. It would also work well with claw/claw/bite type attack routines that the Monster Manual is fond of without making the monsters using it unbeatable attack machines. At the same time, it preserves the simplicity of OD&D's d6 based damage and hit dice, without making fighters underpowered. Moldvay fighters are much better than their blue book counterparts, but in the original Holmes combat system they actually come out looking pretty good. Once Zenopus's series is done, I think this may create the basis for a really robust set of Blue Book D&D house rules, which I could see becoming a go-to for my future games.